Kasippu racketeers behind campaign against beer! Illegal liquor racketeers are in a covert campaign against the increase in excise taxes for hard liquor through the budget, ‘Sathhanda’ reports. They have bribed a newspaper with a massive sum of money to give publicity to their campaign. This follows the release of results of a study by Colombo University, which indicates that Sri Lanka has a 85 per cent use of the hard liquor spirit. Of that, 49 pc is illicit liquor. Beer consumption is 13 pc and wine two pc, according to the study’s findings. In 2015 and 2016, policy changes were made to raise the tax on arrack by 25 pc, and 70 pc for beer and wine. According to estimates, 60 pc of liquor in use in the country are produced illegally. Racketeers use chemicals to increase the alcohol content, which is harmful to health. They are concerned by a belief that the finance minister would ease the high taxes on beer and wine to discourage the consumption of hard liquor. Compared to other countries in Asia, Sri Lanka consumes hard liquor most – 85 pc, while beer and wine consumption are 13 and two pc respectively. 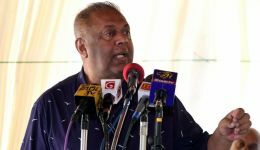 The study has also revealed that 95 pc in Nuwara Eliya, 78 pc in Puttalam and 40 pc in Hambantota use the illicit liquor Kasippu. Recently, the cabinet approved amending the excise act to make a license mandatory to tap coconut and palmyrah toddy.